Creationists often think of the Flood as a big geological disaster, and rightly so. When the water overflowed the land, it left behind millions of cubic miles of new rock and fossils. Massive volcanoes exploded all around the globe. Even the continents moved. 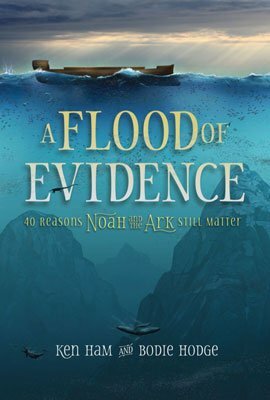 Sometimes we forget, though, that the Flood had a huge impact on living things, too, beyond just killing the land animals and people outside the Ark. When Noah and his family left the Ark, they found themselves in a very different world than the one they grew up in. The comfortable, specially created places where they lived before the Flood were gone, obliterated by the rising torrents of water and crashing continents. The post-Flood world was something of a desolate wasteland. The years right after the Flood must have been especially difficult. Wild plant life was relatively sparse. The few trees alive were just saplings. The air was still clouded with volcanic dust, and the waters probably still carried debris from the Flood itself. What Did Noah’s Grandkids Look Like? Biologically speaking, humans (and just about everything else) went through a “bottleneck” at the Flood. This means that the human population was reduced from millions1 to just eight. Most of the genetic diversity from before the Flood was lost. The new human race descended from Noah and his family, who carried all the genes that were eventually passed down to us today. Does this mean that Noah and his family already had genetic disorders like cystic fibrosis and Huntington’s disease? Probably not. These modern disorders are probably mutations that may have occurred during or after the time of Noah. Normally, mutations have very little effect at all. They produce new copies of genes, called alleles, that are usually “just as good” as the original copy, but occasionally those new alleles are harmful. These harmful alleles are the most likely source of many of our modern genetic ailments. Other alleles, possibly even harmful versions of genes, could have existed prior to the Flood, but many of them would have been lost, as we will see. What Have Mutations Really Changed? Most people have heard the term gene but are less familiar with the term allele (pronounced uh-LEEL). A “gene” is a specific segment of DNA that contains the code for specific traits, such as eye color, and most genes code for more than one trait. Alleles are the various versions of genes that appear in a population. When we speak of “genetic diversity” or “differences” in genes, we mean that there are multiple alleles of a particular gene, not that there are entirely new or different genes. God initially created some alleles in Adam and Eve, but others were generated by mutations, or mistakes, in DNA copying. For example, every human has a gene for eye color, called OCA2. Different variations of OCA2, called alleles, are believed to code for brown, hazel, or blue eyes. Everyone has a copy of this OCA2 gene, but our individual eye colors are determined by which OCA2 alleles we have. When we look at humans today, we want to know where all these variations came from. Did these variations exist before the Flood, or did they appear after the Flood? By studying the frequency of alleles and the geographic distribution of alleles, we try to reconstruct what ancient populations might have been like and when they changed. D. L. Duffy et al., “A Three-Single-Nucleotide Polymorphism Haplotype in Intron 1 of OCA2 Explains Most Human Eye-Color Variation,” American Journal of Human Genetics 80 (2007): 241–252. If everyone had very similar genes after the Flood, what did people look like back then? Surprisingly, people who lived just after the Flood probably had much greater differences in appearance than they do now. When we look at the earliest human fossils, which were likely formed after the Flood, we find at least two big variations in the human form, Neanderthals and Homo erectus. Both had skulls that differ considerably from modern people, but most creationist experts consider both forms to be “human.”2 By human, I do not mean that Neanderthals and Homo erectus were just like modern people. I mean that they descended from Adam and Eve. Does our common parentage mean that somewhere among the six billion people on this planet someone might still be carrying around erectus genes? That seems very likely. The genes for the unique skull shapes were probably lost (since no one has an erectus skull shape today), but statistically speaking, it is likely that some of the genetic diversity in people today was already present in Noah and his family. And if Noah’s sons and daughters-in-law had that variation, then it was probably passed on to the people known as Neanderthals and erectus, just like the rest of us. So it’s not exactly correct to say that we have Neanderthal genes but rather that we and Neanderthals both inherited variations from the same source—Noah’s family. That would be true for most genes, with one small but important exception: mitochondrial genes. Every cell stores genes in its nucleus. But a small set of genes are also stored in the energy factories of the cell, called the mitochondria. 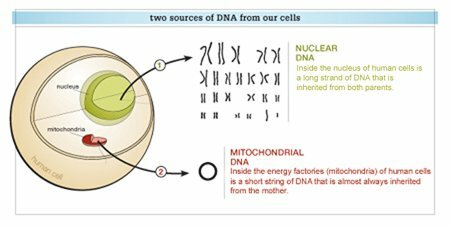 The mitochondrial genes are separate from the nuclear genes. 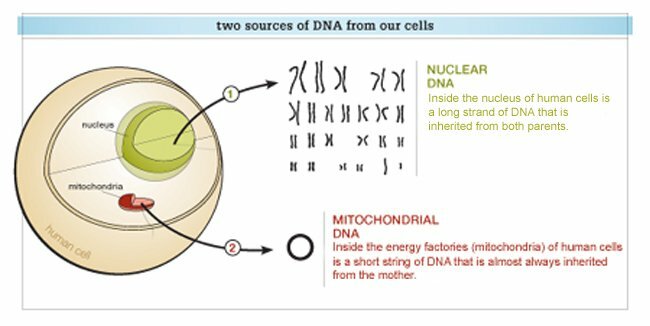 Our nuclear genes come from both parents, but our mitochondrial genes almost always come only from our mothers.3 If a woman fails to have daughters, her mitochondrial genes won’t be passed on to future generations. They go extinct, as it were. As a result, it is relatively easy for mitochondrial gene diversity to be lost during a bottleneck. Sure enough, when we examine people’s mitochondrial DNA today, we find very little diversity. Generally, mitochondrial genes are very similar. That also implies that there has been little time for mutations to occur. The ancestor of our mitochondrial genes, the woman from whom humans inherited their mitochondria, must have lived relatively recently (just how recently is a matter of debate). Why is DNA “170,000 Years Old”? Dating human DNA at “170,000 years” is an interpretation based on certain starting assumptions. Nearly every conventional estimate of the human mutation rate and times of divergence is based on the assumption that humans and chimpanzees had a common ancestor that lived about 5–7 million years ago. But Scripture indicates that this assumption is wrong. Humans were created separately from apes about 6,000 years ago. Combining this information within the constraints of the biblical dates for Babel, it should be possible to recalculate the dates of divergence (when mutations first appeared and various people groups arose)—something creationists have not yet done. In any event, the dates given in conventional science should be rejected because humans were specially created by God and do not share an ancestor with any apes. When scientists examined the mitochondrial genes from Neanderthal fossils, they found that these genes are distinct from ours. This implies that different women are the source of the mitochondrial DNA of living humans and Neanderthals.4 That doesn’t mean that Neanderthals aren’t human; at one time (probably before the Flood) there was a woman who originated mitochondrial gene variation that is shared by both modern humans and Neanderthals, and then a later descendant of that woman (perhaps one of the women on the Ark or one of her daughters) originated the mitochondrial gene variation associated with modern humans alone. The diversity in our nuclear genes probably came from people who lived before the Flood; however, our less diverse mitochondrial genes seem to have come from a more recent ancestor. The story is different when we examine genes in the nucleus, which are passed down from both males and females. We have found a lot of diversity in nuclear genes, and these genes appear to be from men and women who are older than the ancestor of modern mitochondrial genes.5 Thus, the diversity in our nuclear genes probably came from people who lived before the Flood and passed their diversity down through several different humans on the Ark. How can different genes in the same person come from different sources? Remember that eight people were on the Ark but only four were women, whom we will assume were not closely related. Right after the Flood, a total of four types of mitochondrial DNA were present among the women of the human population. There were even more types of nuclear DNA among both the males and females. Now imagine how quickly the types of mitochondrial DNA could be lost. 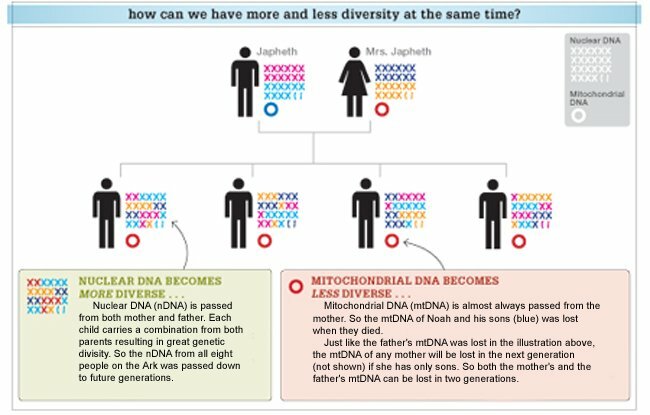 If Japheth had one daughter and this daughter did not have any daughters, then the mitochondria of Japheth’s wife would have been lost, but Japheth’s nuclear genes would survive through his sons. In this way, mitochondrial diversity can be lost quickly during a genetic bottleneck, while nuclear diversity can be preserved. By now you might be wondering about “mitochondrial Eve,” the name that evolutionary biologists give to the supposed mitochondrial ancestor of modern humans.6 I think you can see now that she was not the biblical Eve.7 Instead, she was probably one of the four women who survived the Flood. Maybe she was Shem’s wife, but the “mitochondrial Shem’s wife theory” doesn’t quite have the same ring to it. Out of Africa . . . or Babel? If the world’s original human settlers all came from Babel, why do modern geneticists claim that the first population came out of East Africa? “Out of Africa” is an interpretation based on certain starting assumptions. Basically, geneticists interpret geographic origin as the place where we find the group with the most genetic diversity. Where they live today is assumed to be the geographic origin of that diversity. This assumption is not necessarily correct. Given how often people move around, where a group lives now is not necessarily where the diversity originated. 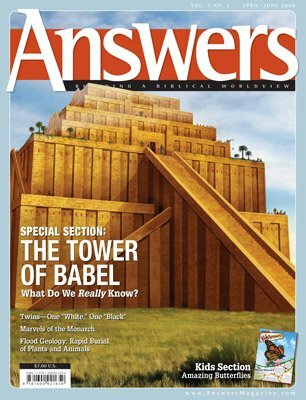 The real geographic origin of all modern humans is Babel, according to Scripture. The high variation in African DNA probably means that the majority of human families coming out of Babel went south and settled in Africa. To be sure, other families settled in other locations, as the Table of Nations indicates ( Genesis 10 ), but the majority of DNA diversity in that Babel population went south. Assuming an exponential growth rate and a 40-year generation time, the human population at the Flood could have been more than a billion. B. C. Nelson, After Its Kind, 4th ed. (Minneapolis: Augsburg Publishing House, 1930), p. 156; M. Brandt, “Homo Erectus—Ein Seefahrer,” Studium Integrale Journal 5 (1998): 90–94; S. Hartwig-Scherer, “Apes or Ancestors? Interpretations of the Hominid Fossil Record within Evolutionary & Basic Type Biology,” Mere Creation, ed. W. A. Dembski (Downers Grove, Illinois: InterVarsity Press, 1998), pp. 212–235; K. P. Wise, “The Flores Skeleton and Human Baraminology,” Occasional Papers of the BSG 6 (2005): 1–13. A. Eyre-Walker, “Do Mitochondria Recombine in Humans?” Philosophical Transactions of the Royal Society of London Series B 355 (2000): 1573–1580. M. Krings et al., “Neandertal DNA Sequences and the Origin of Modern Humans,” Cell 90 (1997): 19–30; G. Gutiérrez et al., “A Reanalysis of the Ancient Mitochondrial DNA Sequences Recovered from Neandertal Bones,” Molecular Biology and Evolution 19 (2002): 1359–1366. R. M. Harding et al., “Archaic African and Asian Lineages in the Genetic Ancestry of Modern Humans,” American Journal of Human Genetics 60 (1997): 772–789; E. Zietkiewicz et al., “Haplotypes in the Dystrophin DNA Segment Point to a Mosaic Origin of Modern Human Diversity,” American Journal of Human Genetics 73 (2003): 994–1015; D. Garrigan et al., “Evidence for Archaic Asian Ancestry on the Human X Chromosome,” Molecular Biology and Evolution 22 (2005): 189–192; A. R. Templeton, “Out of Africa Again and Again,” Nature 416 (2002): 45–51; A. R. Templeton, “Haplotype Trees and Modern Human Origins,” Yearbook of Physical Anthropology 48 (2005): 33–59; A. R. Templeton, “Genetics and Recent Human Evolution,” Evolution 61 (2007): 1507–1519. R. L. Cann, M. Stoneking, and A. C. Wilson, “Mitochondrial DNA and Human Evolution,” Nature 325 (1987): 31–36; A. Gibbons, “Mitochondrial Eve: Wounded but Not Dead Yet,” Science 257 (1992): 873–875. We can only infer the nature of the last common ancestor of mitochondrial genes. 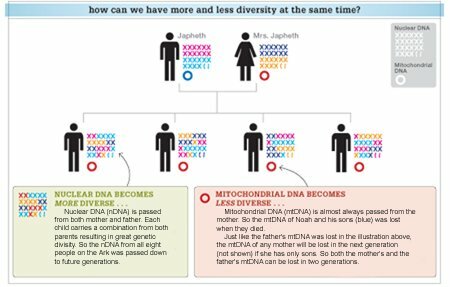 Theoretically, that woman could have had exactly the same mitochondrial genes as Eve, but that seems unlikely or at the very least an ad hoc assumption.